Editors get very passionate about books they work on – the Editor’s Desk series is his or her place to write in-depth about what makes a certain title special. Get the real inside-scoop on how books are shaped by the people who know them best. 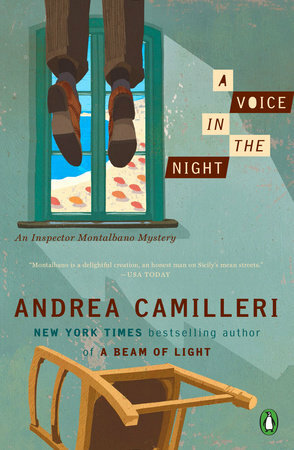 Last fall, we celebrated New York Times and internationally bestselling author of the Inspector Montalbano mystery series Andrea Camilleri’s 90th birthday with the publication of A Beam of Light. This year we’ve hit another incredible milestone—A Voice in the Night is the twentieth novel in his Montalbano series. Having the opportunity to work on a beloved cult classic like the Montalbano series is truly a privilege. The novels sensuously capture the sense of Sicily, from the sun-soaked buildings and seaside views, the simmering food on Montalbano’s plate, to the do-as-you-please attitudes of its inhabitants. The books are translated from Italian, and Stephen Sartarelli’s skill as a translator is on ample display in the ease and rhythm of the quick-witted and wryly humorous dialogue. In reading the first draft, I found it fascinating to consider the nuances of translating from the Italian, as Camilleri often employs several Sicilian dialects within a single novel. I do wonder what cultural idiosyncrasies are lost in translation, but am always pleased that the humor and warmth translate fully. A Voice in the Night brings us back to the Sicilian town Vigàta, where Montalbano’s moody demeanor has taken a dive as another birthday rolls around. To cheer himself up, he deals with a young driver’s road rage in his own way, and surprisingly, finds himself confronting the young man once again, this time as the suspect of a gruesome murder. Many of the series’ trademarks make a welcome appearance in A Voice in the Night—lighthearted spats and make-ups with Livia, Catarella’s mispronunciations as unintentional linguistic jokes, the seemingly omnipresent influence of the mob in both the streets and halls of government. And of course, there is the food. (A particularly memorable scene casts a two-foot octopus as murderous foe before vengeful food dish.) Camilleri’s charming creation, Inspector Montalbano, continues to delight and surprise me. Flawed but lovable, the Sicilian Inspector is great company, and it’s with a lot of enthusiasm that we get to share this series with English speaking readers. A Voice in the Night won’t disappoint longtime fans of the books, but it’s also a good jumping-off point for new readers to acquaint themselves with Montalbano’s Sicily. Luckily for me, and for you, dear reader, this isn’t Montalbano’s last case. Editors get very passionate about books they work on – the Editor’s Desk series is his or her place to write in-depth about what makes a certain title special. Get the real inside-scoop on how books are shaped by the people who know them best. Among the victims of the terrorist attacks in Paris last November 13 was a young mother named Hélène Muyal-Leiris. That night, she went to the Bataclan concert hall, while her husband, Antoine Leiris, stayed at home, looking after their 17-month old son, Melvil. Three days after the attacks, Antoine wrote an open letter addressed directly to the terrorists who had murdered his wife, which he published on Facebook. You may have read it at the time. 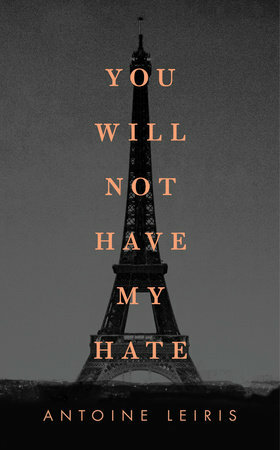 It was titled “You Will Not Have My Hate” and within days had been shared millions of times and reported on across the world. “Victim’s Husband Tells Terrorists, ‘I Will Not Give You the Gift of Hate’,” read the headline in the New York Times. Afterwards, Antoine continued to write about caring for his son alone and burying Hélène. His account of the days and weeks following the attack was soon published in France as book with the same title, You Will Not Have My Hate. When I was sent the manuscript by the French publisher, I read it with tears in my eyes, and more than once, as I worked with the translator, Sam Taylor, I felt overcome by Antoine’s bravery and kindness. His words of grief are startlingly simple and direct, which made the translation process quite straightforward. There were only a handful of instances where Sam and I had some uncertainties about the best phrasing in English (and every time Sam found the ideal solution). Like his letter, Antoine’s book has received passionate gratitude the world over. It will be published in 24 languages and is already a bestseller in multiple countries. This success is because the book is extraordinary, full of heartbreak and sorrow, but also love and hope. It is inspiring. Antoine describes one of the letters he received after he published his open letter, in which a stranger wrote to him, “You are the one who was hurt, and yet it is you who give us courage.” I think there’s a tendency to consider something that has been published as a book as completed, as the past. But it has been less than a year since the attacks in Paris. For those of us who weren’t directly affected, the events have perhaps already been displaced in our memories, pushed to one side as horror has struck again and again. In Orlando, San Bernardino, Nice, Baghdad, and elsewhere. It can seem like we barely have time to mourn one attack before another happens. But You Will Not Have My Hate reminds us sharply of the inconceivable pain of such tragedies. It is both a private story and a universal one. Both a love letter and farewell. To read it is to grieve for a stranger with all one’s heart.